Starting English lessons early gives students an opportunity to engage in vocabulary building, grammar skills, and writing. In turn, this will help them strengthen their understanding of the content when they become readers as well as making real world connections and strengthening writing skills. Grammar is the focus of written and verbal communication, which allows us to be plainly understood. The use of poor grammar affects the ability to communicate and delays the building of relationships (important skills for young children to develop). When grammar is used correctly, it makes reading and listening easier, allows communication to be more meaningful, and has a positive impact on building relationships. 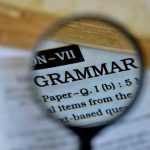 Grammar empowers students to build vocabulary and permits them to communicate and present information more efficiently. Students do not have to know how to read when building vocabulary. Most of a student’s vocabulary is acquired before the child becomes a reader. Students who have a developed vocabulary significantly increase their ability to read. Developing a strong vocabulary at an early age helps students make connections to prior knowledge and apply that knowledge to future learning. Because the brain of a child learns by connecting new information to old information, knowing words before reading them understand the process of reading and improves comprehension. Children who have a well developed vocabulary before they enter Kindergarten learn new words at a faster pace than those who struggle with vocabulary. Starting English lessons early includes reading to the student. The use of picture books to associate objects and words and their meaning. Discussing important words that the student does not know and connecting them to real world examples will make reading and comprehension much easier for them when they begin to read. Although learning punctuation very young sounds like a bit much, it does make a difference with early literacy. When students are being read to, it is important to point out punctuation and help the student to build a relationship with that punctuation. That makes used to seeing it, so when they begin to read and write, it will be less intimidating. Remember: The point is familiarity, not in-depth understanding of how the punctuation works. Students who learn how to use their grammatical knowledge and vocabulary reasoning have an easier transition from verbal language to written language and can be taught to write and read at a greater proficiency. Long story short, student who start English lessons early tend to do better than their peers and have an easier transition at later stages of literacy development. Did your children start their English lessons young? How did it help them?